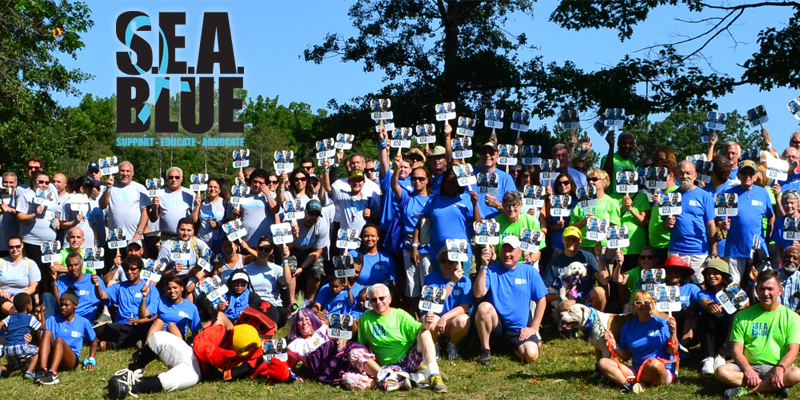 Please join us on Saturday, August 19th, in Genesee Valley Park for the 3rd Annual SEA Blue Ribbon Walk for Prostate Cancer! This is a very special annual event where local communities gather to increase awareness about prostate cancer while raising funds for Us TOO to provide Support, Education, and Advocacy at no charge to those affected by the disease. Online registration starts at $20. Onsite registration at the event will be $30. SEA Blue is a declaration from those who have risen to the challenge to fight prostate cancer, a celebration of those who have conquered the disease, and a tribute to those who have lost their battle. People affected by all aspects of prostate cancer band together around Support, Education, and Advocacy to build camaraderie at SEA Blue through togetherness, tears, and triumph. Please join us. Register to attend. Build your family team, or join an existing team. And invite your friends to register too. For questions, contact (585) 787-4011 or email ustoorochesterny@gmail.com.